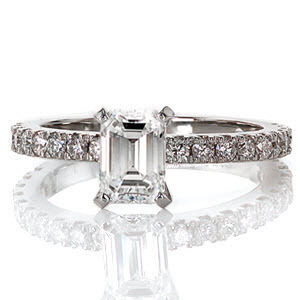 Emerald cut engagement rings are stunning, beautiful, and unique, and we are proud to offer them at Knox Jewelers. 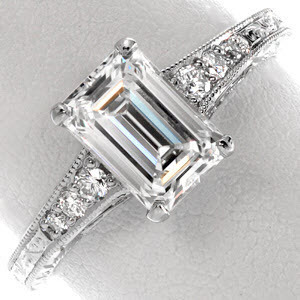 Why should you consider an emerald cut center stone over the plethora of other options available to you? 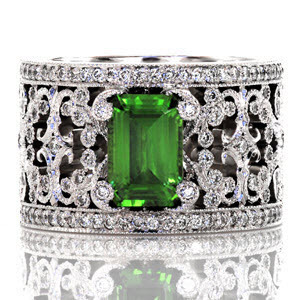 For one, rings with emerald cut center stones are popular among the powerful and famous, including Camilla Parker Bowles (wife of Prince Charles), Grace Kelly (fiancée of Prince Rainier), and Melanie Knauss (fiancée of Donald Trump). The emerald cut is an elegant cut which incorporates a stepped square stone with cropped corners in order to reduce light dispersion and brilliance. Let’s take a closer look at this cut now and show you just how versatile and lovely it can be in any context or design. Originally, the emerald cut was designed – unsurprisingly – as a special way to cut emeralds in order to address the issue of inclusions that emeralds naturally have. 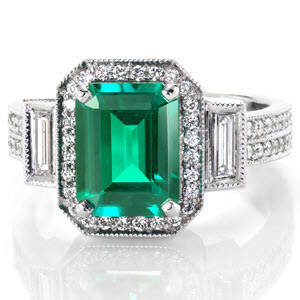 However, as time progressed, the emerald cut found its way into use with other stones, too, including diamonds. Today, the emerald cut is widely regarded as bold, elegant, and striking- all of which are attributes we strive to imbue within our own designs at Knox Jewelers. And, as we’ll discuss shortly, we’ve taken this classic cut in innovative new directions. The emerald cut has a number of valuable properties which make it a great and versatile choice for those customers looking to incorporate elements of nobility and boldness in their engagement ring for that special someone. What makes an emerald cut stone so versatile is its ability to be placed in almost any context and still look amazing and harmonious with the other elements of the ring. 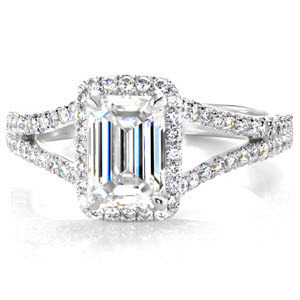 For instance, it is not rare to see an emerald cut center stone crafted in conjunction with such features as micro pave and halos, to name a couple. To that end, we offer an almost unlimited variety of customizations options for your emerald cut engagement ring at Knox Jewelers. 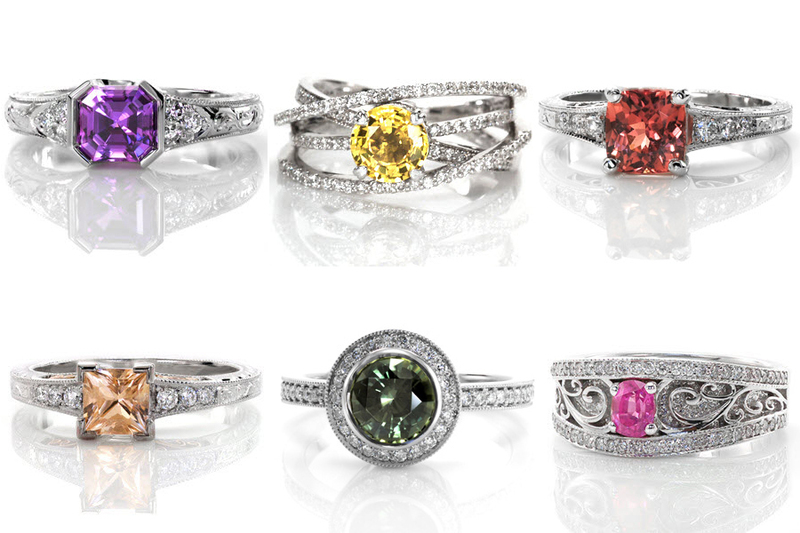 To best show you the variety of options available to you, let’s take a close look at some of the engagement rings we have designed for our customers. A stunning example of a hand engraved solitaire we have designed in the past is our Emerald Cut Whisper ring. 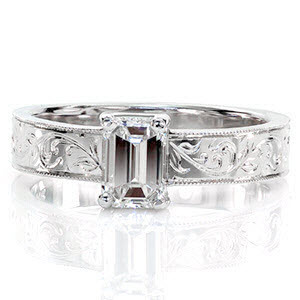 This beautiful design features a hand engraved pattern reminiscent of wheat that gently guides your eye to the luxurious .65 ct emerald cut center diamond. 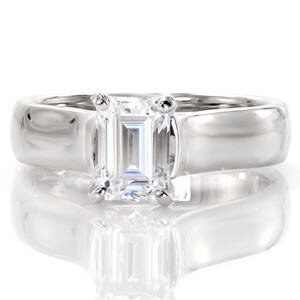 Naturally, you are not limited to emeralds or diamonds when it comes to the emerald cut. Our lovely Design 1158 is a striking variation of our Lucille design which swaps the center diamond for a gorgeous sapphire that truly gets the spotlight on this platinum-based ring. We are quite fond of micro pavé stones, here, and Design 1857 takes our fondness for them to an entirely new level. This exquisite ring evokes a sense of nobility and pride due to the .80 ct emerald cut diamond that is framed in a four prong setting. Micro pavé stones are present all along the exterior of the 14K white gold band. 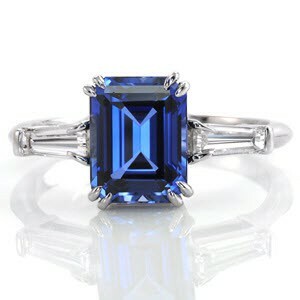 This design truly exemplifies the versatility of an emerald cut stone. The final ring we want to showcase is our brilliant Design 2754. As we said before, an emerald cut center stone can be used in just about any kind of context, including within a halo arrangement. 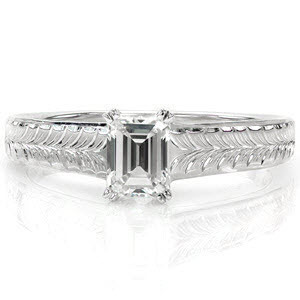 In this piece, a 1.00 ct emerald cut emerald is embedded within an Art Deco-inspired micro pavé halo and shoulder detail. No matter the surrounding elements, an emerald cut stone is guaranteed to both enhance those elements as well as look fantastic all on its own. 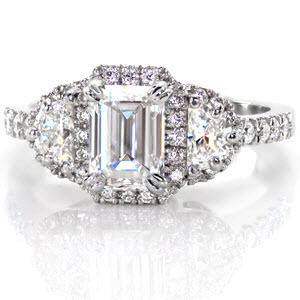 If you are interested in incorporating an emerald cut center stone in an engagement ring for that special someone, then please do not hesitate to contact our friendly staff here at Knox Jewelers. We would be thrilled to discuss the options available and how best to utilize this remarkable cut in a stunning piece just for you. We’ll explore different customization options, including band types, engravings, and more. We look forward to working together with you to design a unique emerald cut engagement ring!